Nvidia's new GeForce GTX 950 delivers a better-than-consoles gaming experience for just $150. When Nvidia launched the $150 GeForce GTX 750 Ti way back in the beginning of 2014, it served as the grand unveiling for the company’s new, supremely energy-efficient Maxwell graphics processor architecture. The insanely tiny card delivered a huge gaming boost over integrated graphics, and since it sipped a mere 60 watts of power, you didn’t even need to connect the card to your power supply—it could run off the juice from your motherboard’s PCI-E slot alone. 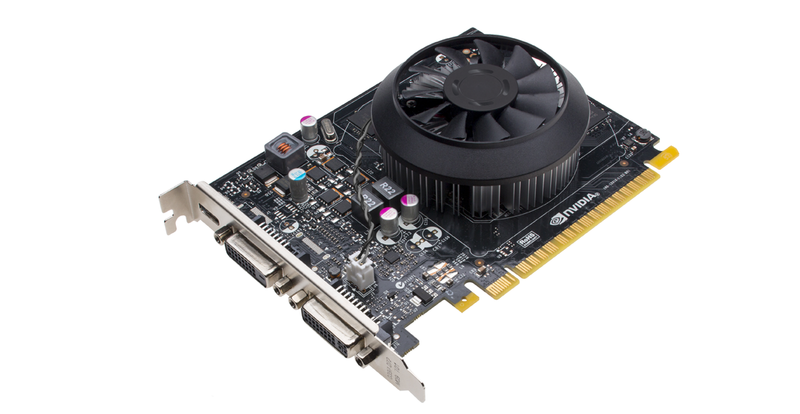 The radically small, radically power-efficient GTX 750 Ti, released in February 2014. That radically changed the potential audience for the entry-level graphics market; you could even slap the GTX 750 Ti in a prebuilt PC (from Dell, HP, etc.) that had no free power supply connections. Maxwell was off to a roaring start. Flash forward a year and a half: The GTX 750 Ti’s form factor is just as enabling as ever, but when it comes to sheer performance, AMD’s Radeon R9 270X kicks it in the teeth—so much so that we’ve long recommended the 270X over the 750 Ti unless space constraints dictate otherwise. And the older GTX 650—one of the most popular graphics cards among Steam users—is starting to get long in the tooth. In the wake of the newly-released $150 AMD Radeon R7 370 (essentially a slightly tweaked, slightly faster version of the older R9 270, which is also still available) Nvidia had to do something to even the score in the crucial, high-volume sub-$200 graphics card market. Meet that something: The $160 Nvidia GeForce GTX 950. This new addition brings some much-needed additional firepower to the sub-$200 GeForce lineup, complementing—but not replacing—the GTX 750 Ti, which will still be sticking around. Will the GTX 950 appeal to people looking to game respectably at 1080p resolution without breaking the bank? Let’s dig in. The first thing you’ll notice upon peering at the GTX 950 is that it positively dwarfs the GTX 750 Ti. 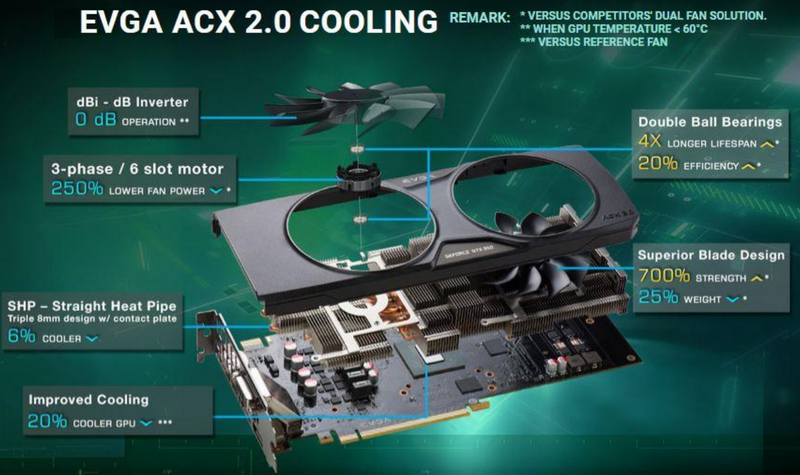 This is a full-size, dual-slot graphics card that requires supplemental power via a 6-pin power connector, unlike its predecessor (though some partner models will feature shortened board lengths). That’s because the GeForce GTX 950’s beating heart is a cut-down version of the 28nm GM206 GPU found in Nvidia’s $200 GTX 960. Whereas the GTX 960 has 1024 CUDA cores, 8 streaming multiprocessors, and 64 texture units, the lower-cost GTX 950 packs 768 CUDA cores, 6 streaming multiprocessors, and 48 texture units—about a third reduction overall. Clock speeds have also been drastically reduced in the GTX 950, down to 1024MHz base/1188MHz boost. For memory, you’ll find 2GB of GDDR5, clocked at a 6600MHz effective rate and chatting with the GPU over a 128-bit bus. That sounds paltry, but don’t sweat it; it’s more than enough for playing games at 1080p with normal- to ultra-level graphics detail settings, which this card aims for. The card supports DirectX 12’s 12.1 feature level, and Nvidia’s also spent time optimizing the GTX 950 specifically for competitive MOBA games like Dota 2 or League of Legends, reducing the number of frames it buffers in the rendering pipeline to improve latency. Using the auto-optimize options in Nvidia’s GeForce Experience software will enable that and other latency-improving tricks (like running in borderless mode rather than fullscreen) with your having to manually tinker with various settings. 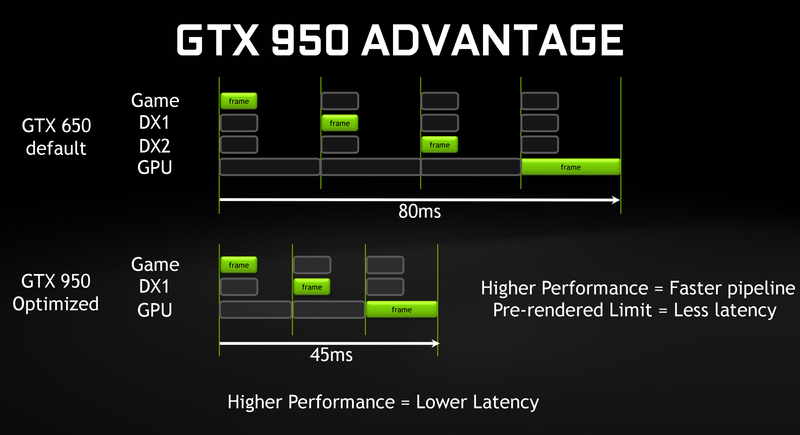 Those optimizations will initially only be available to GTX 950 users, but Nvidia says to look for them to expand to other GeForce graphics cards in the future. Speaking of GeForce Experience, Nvidia’s slick software is receiving an overhaul of its own in September, via a new beta version that adds a new in-game overlay menu that features direct-to-YouTube video sharing, and—more interestingly—GameStream Co-op, which lets you beam your games over the Internet so your pals can play along with you in the Chrome browser. Read all about it here. Wrapping things up, the GeForce GTX 950 rocks a trio of DisplayPort 1.2 connections, a single HDMI 2.0 port, and a single DVI-I hook-up. Nvidia recommends using a 350-watt or higher power supply with the card, which rocks a TDP of a mere 90W. 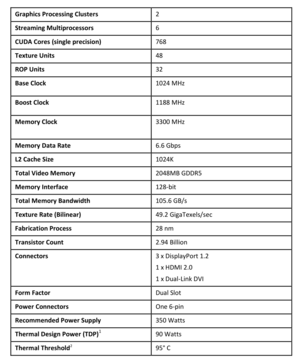 That's 30W more than the GTX 750 Ti, but 30W less than the GTX 960's 120W TDP. The GTX 950’s release is a hard launch, meaning that Nvidia’s various board partners will have cards available immediately. 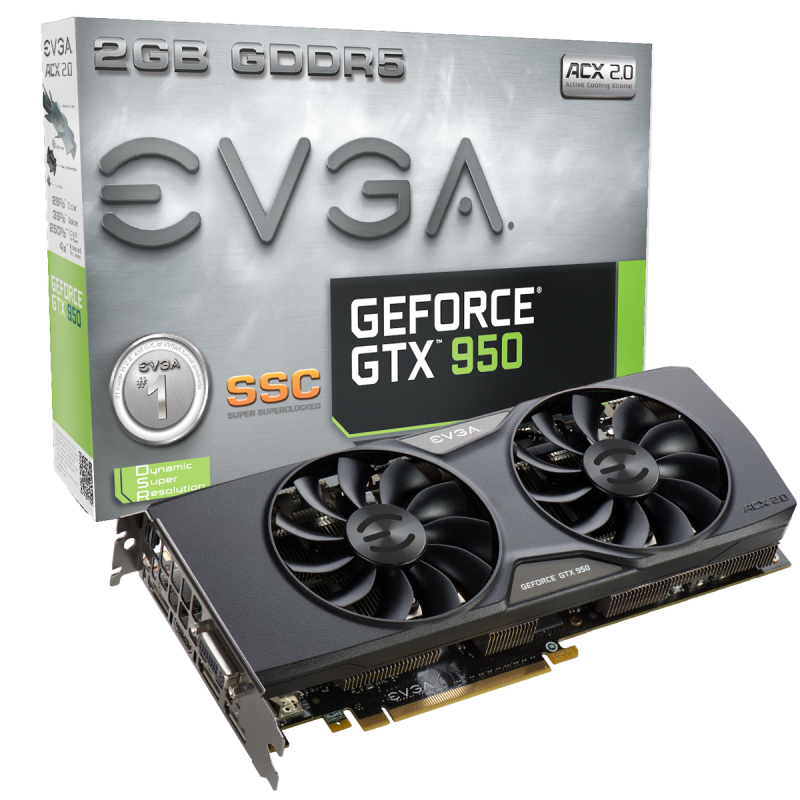 Our review board is EVGA’s customized, GeForce GTX 950 SSC ($170 on Amazon), the second most powerful graphics card in EVGA’s GTX 950 blitz, which consists of four separate models. This "Super Superclocked" card packs a hefty overclock out of the box, jacking the GPU’s base clock speed to 1190MHz—faster than the stock 950’s boost speed—and the boost clock speed all the way to 1393MHz. The memory clock speed remains untouched, though you can use EVGA’s superb PrecisionX overclocking software to give the card’s GPU and memory even more pep in their steps. (PCWorld’s guide to graphics card overclocking can help.) 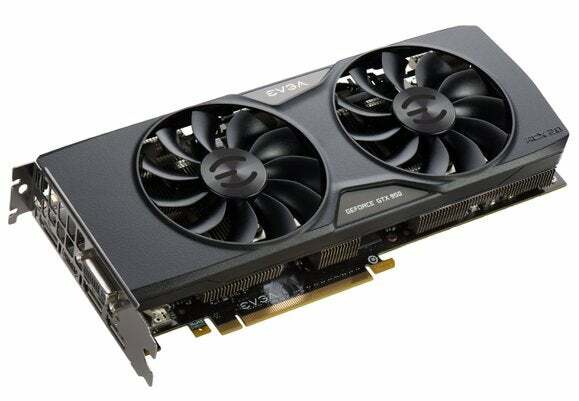 There is a tradeoff for those high out-of-the-box overclock speeds, however: The EVGA GTX 950 SSC requires an 8-pin power connection, rather than the stock GTX 950’s 6-pin connector. The GTX 950 SSC boasts EVGA’s ACX 2.0 cooling system, which we’ve seen used to great effect before with the GTX 960 and various other GPUs. The dual fans on the card don’t even activate when GPU temps are hovering under 60C. Rather than diving into nitty-gritty details about ACX 2.0’s triple 8mm straight heat pipes and double ball bearings again, here’s a high-level look at the system. Finally, the EVGA GeForce GTX 950 also offers a dual-BIOS selector: With the flip of a switch, you can change between two profiles with different fans curves. One pushes fan RPMs as low as they can go when the card is idle, to reduce noise levels, while the “SSC Performance BIOS” keeps the pedal to the metal. Whew! Now that all that’s done, let’s dig into the fun stuff—gaming benchmarks. 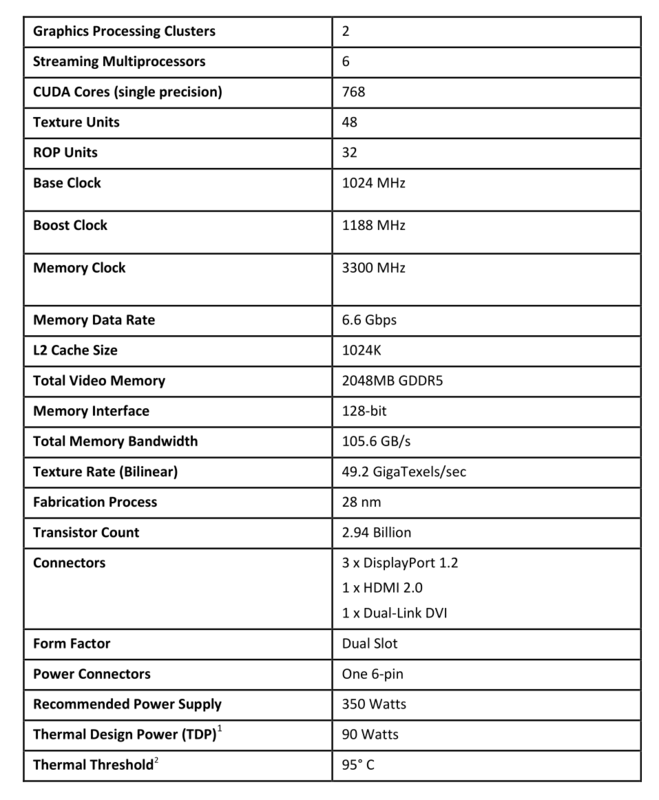 Next page: Gaming benchmarks and testbed configuration details.